Crowns are permanent fixtures, but they can occasionally come loose and need to be replaced. 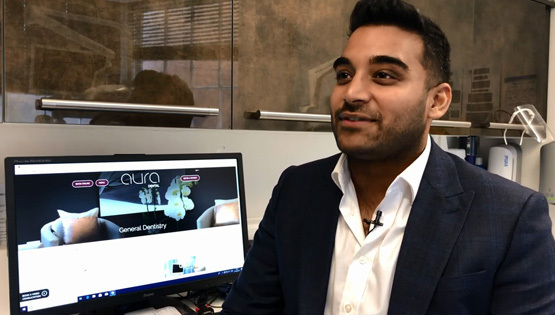 Caring for a crown requires proper dental and gum care as instructed by a dentist. 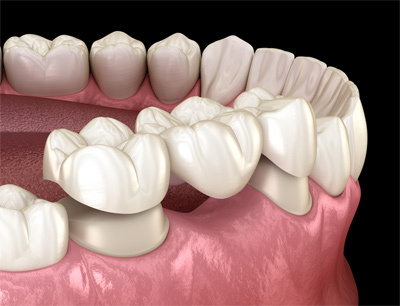 A bridge is a device that is used as one of the ways of replacing a missing tooth. There are two types of bridge; a conventional bridge or an adhesive bridge. 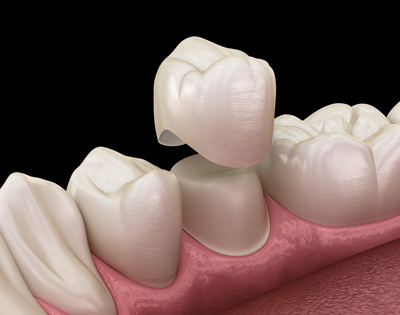 A false tooth is attached to a crown on one or both sides of a gap. It involves quite extensive drilling of the tooth (or teeth) to which the false tooth will be attached. The crowns are either made of gold, a non-precious metal, or a combination of metal and porcelain. The false tooth is usually made out of tooth-coloured porcelain. When using an adhesive bridge to replace a front tooth, the metal wing is stuck on to the back of the adjacent tooth and so cannot be seen from the front. An adhesive bridge replacing a back tooth will have metal wings on one or both sides of the gap. These may be visible if the mouth is opened wide. The adhesive bridge is stuck on with a very strong glue. The process requires that the teeth be dry whilst gluing.